Himachal is known as one of the best destination when it comes to leisure activities like fishing and angling. Get mesmerized by the natural surroundings of snowclad peaks and watch the sun go down spreading variant hues in the sky. And if one takes a pleasure in exploring the surroundings, then there are plenty of trails near the lake side just waiting to be discovered. Arrive Aut and transfer to Shoja through the scenic Tirthan valley. A confluence of Parvati & Tirthan Rivers at Larji offer magnificent fishing beats. After crossing a small but busy town of Banjar, the road winds through terraced field & fruit orchards. Streams joining the river at Jibhi & Giyagi offer spectacular landscapes dotted with small grain grinding huts. After Giyagi, the access to Shoja winds through thick forests of alpine trees, which provide an untouched Habitat to various species of flora & fauna. On arrival at Shoja, the landscape opens up into beautiful terraced fields followed by rolling meadows of wild flowers. Enjoy the rest of the day at leisure at the camp. One can explore the surroundings on bear trail, pheasant ridge or village trail. Early morning drive to Goshiani via Banjar with packed breakfast. Start fishing in river Tirthan. The river flows through Bathad, Goshaini and merges with Parvati at Banjar. 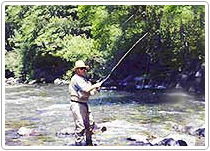 Abound in trout, Tirthan offers excellent opportunities to an avid angler. Hot lunch at Goshani with bar-be-qued catch. After lunch, return to the camp. Rest of the day at leisure. Dinner and bonfire at the camp. Same as day 2 or trek to Sereolesar Lake. After breakfast, trek to Sereolesar Lake through a thickly narrow path. One can get an occasional view of the meadows beyond the thick curtain of the forests. The onward trek is smooth and downhill. After lunch trek back to the camp, which is an uphill and a little taxing walk. Arrive in the evening. Dinner and overnight stay at the camp. Transfer to Kullu or Delhi.